My career as a costume maker was the catalyst that set me on the path to leading a more sustainable life, but as well as exposing concerns about the fashion industry it also led me to the uncomfortable realisation that the film and television industry is also far from sustainable. Unlike workers in garment factories I am paid a fair wage and considered a skilled craftsperson, but I still couldn’t help worrying about the environmental impact of the job I love. 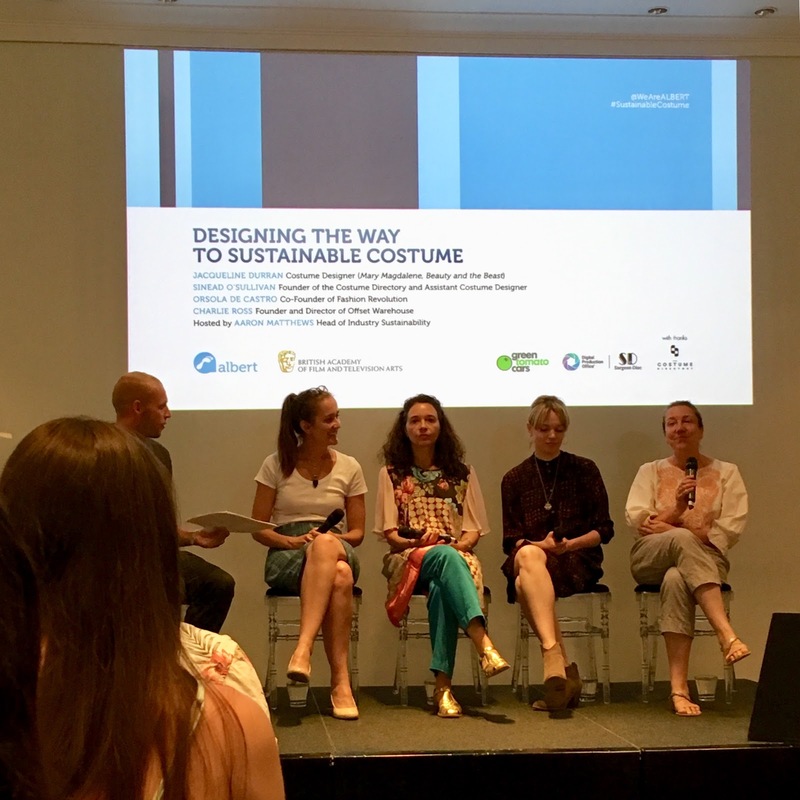 Fortunately other creatives in my industry have the same concerns, so on a sweltering Friday evening, in a blissfully air-conditioned room at BAFTA HQ, we heard from a panel of experts about the changes we need to make as Costume professionals. Aaron Matthews, the head of industry sustainability, opened the session and introduced the speakers. First up was Sinead O’Sullivan, Assistant Costume Designer and founder of the Costume Directory, an open resource for responsible suppliers. Alarmingly, a film or television production can produce more waste in a week than the average household will produce in a year, and the costume department of any show is inescapably linked to the fashion and textile industries. While many of us might be conscious of recycling and waste reduction on a personal level, we are likely to tolerate more wasteful behaviours at work because of lack of regulation or time to source better alternatives. The ever-changing nature of freelance work in costume departments makes it hard to stick with the same suppliers; fabrics that were perfect for an 18th Century costume drama won’t be right for a gritty modern film. Similarly, costume departments can generate a lot of waste if multiple copies of a costume are needed to be broken down or damaged on-screen. Sinead stressed the importance of individual as well as collective change: the change has to come from the people working in costume departments as it isn’t going to come from studios or producers. Sinead asked us to think about the small changes we could make that would add up to make a big impact. She gave a pretty comprehensive list that I think all of us in a creative field could get some useful ideas from. Ask for more comprehensive recycling facilities at work? Make ourselves aware of harmful chemicals in dyes etc? Find ways to filter microfibres from our laundry? Buy more costumes for contemporary shows from secondhand or charity shops? Create less single-use costumes; make use of costume houses and reuse resources? Next up to speak was Orsola de Castro, co-founder of Fashion Revolution. Set up following the Rana Plaza factory collapse in Bangladesh in 2013, in which over 1000 garment workers, mostly young women, lost their lives, Fashion Revolution set out to ask high street brands “who made my clothes?” A question which, Orsola says, it was almost impossible to find answers to. For her, the first step towards a more ethical fashion industry is transparency (“you cannot change what you cannot see”), and we should all be more vigilant and scrutinise what we buy. Orsola sees the wardrobe department of a production as being three-quarters of the way through a garment’s life-cycle, from textile to landfill, and reminded us that there was such place as “away” when we discard unwanted clothing! In Orsola’s eyes, we are not using design cleverly enough. We are using design to create a problem (pollution and waste) rather than solve a problem (we all need clothes to wear). This is a criticism I have thrown at the fashion industry in the past, and while I think that my workplace does well when it comes to creatively using available resources (more on that later) it is definitely something we could all pay closer attention to. As well as changing our own practices, Orsola reminded us of our responsibility to inspire young designers and students to learn a more sustainable way of working from the start of their careers. There are plenty of free resources on the Fashion Revolution website, like their fanzine, as well as their Transparency Report on high street brands. She pointed out that sustainability is not a passing trend; it has been a way of life for thousands of years, and it is excess that is the passing trend. We only have to look at the history of the modern fashion industry that started with the Industrial Revolution to see how it is built on exploitation. We have an opportunity to change things and, in the words of Joan Crawford, “care for your clothes like the good friends they are”. 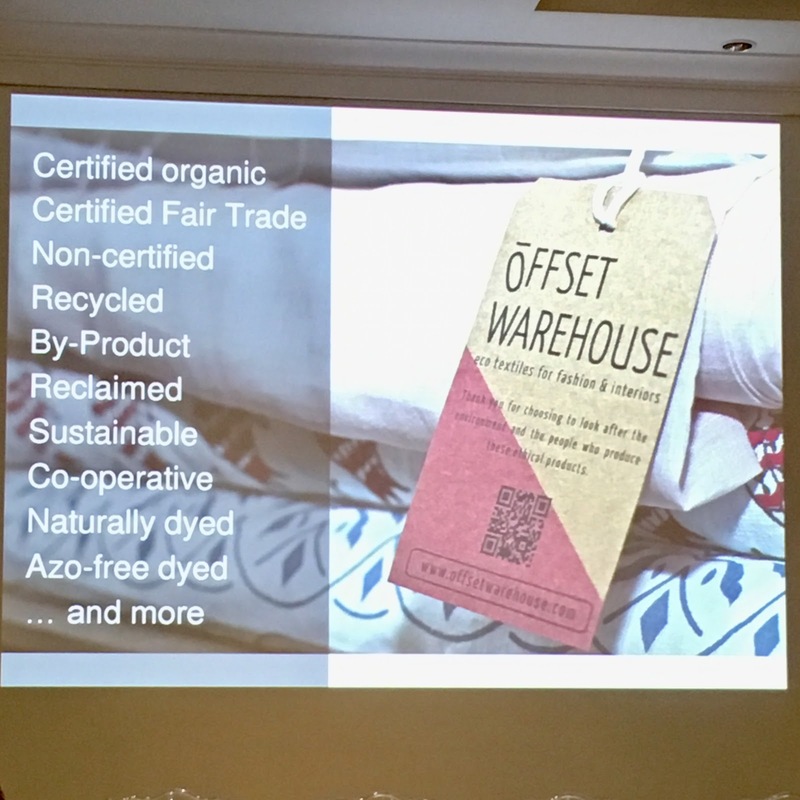 We also heard from Charlie Ross, founder and director of Offset Warehouse, the first textile company in the U.K. to exclusively sell ethical fabrics. Charlie’s journey from student designer to ethical entrepreneur began when she watched the film “China Blue” at fashion college. The film revealed widespread exploitation within the fashion industry, and Charlie realised that the impact of a product occurs right across the supply chain, including textile production. The garment industry is responsible for tragedies that aren’t as well-documented as the Rana Plaza disaster; for instance thousands of farmer suicides in India as a result of the exploitative cotton industry, or the draining of the Aral Sea for cotton production in Uzbekistan. The textile industry also uses harmful and toxic dyes, so fabrics can keep making a negative impact on the environment when they are being laundered. Her talk highlighted the importance of considering the impact of the fabrics we buy: giving our money to exploitative, wasteful manufacturers is giving our unspoken approval to their harmful practices. While (sadly!) there isn’t a magic fabric that can solve all our problems, if we keep making small changes, buying from textile manufacturers who pay fair wages and don’t damage the environment, opting for organic cotton and dyes, we can start to make a positive impact. Oscar- and BAFTA-winning costume designer Jacqueline Durran joined the other speakers for a panel discussion and Q&A. Jacqueline spoke about creating a completely sustainable costume for Emma Watson in Beauty and the Beast, talking through the different fabrics used on the costume, on display at the side of the stage. Inspired by the Green Carpet Challenge and Emma Watson’s personal interest in sustainable fashion, Jacqueline created a costume made from vintage wool and cotton, nettle fabric, sugar cotton and fabrics from Offset Warehouse, making use of the expertise of her costume team to custom-dye, print and paint fabrics using traditional techniques. Jacqueline discussed the benefits of working with actors who wanted to wear sustainable clothing (a focus on sustainability makes designers aware of each stage of costume manufacture, and all the boxes they have to tick) and the downside of working with experimental new materials (“we ordered some mushroom leather, and what arrived was just a mushroom”). Sinead, who has worked with Jacqueline on a number of productions, described the specific needs of the industry which the Costume Directory is trying to meet. She features suppliers who can provide low minimum orders, and fill and ship their orders quickly. She acknowledged that this was just the start of the big change that the industry as a whole needs to make, and that we all need to be responsible for contributing to this. 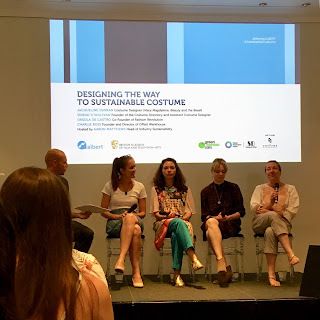 Jacqueline sees the goal as normalising sustainability in costume departments, and suggested that if we weren’t in a position to demand change we were in a position to ask questions and get a conversation going about sustainability. Some studios like to draw attention to environmentally friendly policies because it is good for publicity, whereas others weren’t keen to feature a particular sustainable initiative in case it drew attention to all the unsustainable practices. One of the questions that came up was what happened to costumes post-production. A lot of costumes are hired from costume houses and are returned when a production wraps and can be used again. 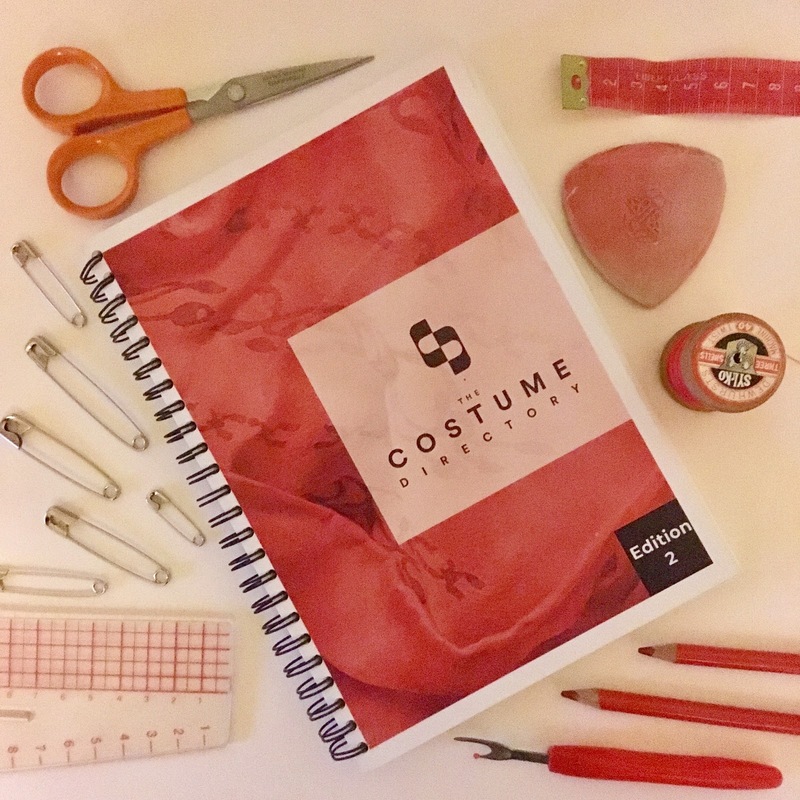 Some costumes made specifically for a production may end up in storage, as intellectual property rights for a particular production might prohibit their re-use. Sinead spoke about the problems with closing down a large department quickly when a film wraps; staff often don’t have time to carefully plan where items can be donated or repurposed. The panel discussed the problems of textile waste; the current facilities in the U.K. are pretty poor so one option is to donate to schools or colleges, or to educational programs that teach sewing skills. The topic of how to teach sustainability was also considered, with panellists discussing the culture of immediacy that has robbed us of our ability to plan! With better organisation, we can make better decisions, but we need to create a new culture that pushes back against the need for instant results. The evening left me with plenty of food for thought. The costume house I work at is actually surprisingly sustainable when it comes to making and re-using costumes. We use a lot of vintage fabrics, and my colleagues and I often end up adopting a zero-waste approach to cutting and making up so we can use every scrap of a precious piece of antique fabric! As well as mending costumes from the hire stock, we often end up re-making clothing that is well past its best in order to save beautiful bits of embroidery or embellishment. I’d be interested to see what changes we could make to become even more sustainable; all my colleagues have re-usable cups and water bottles, and our communal kitchen is full of recycling bins, but we often spend lunch breaks trying to solve our biggest sustainability bugbear: plastic garment bags. The research that several of us have done into textile and plastic recycling for our particular needs has revealed a lack of facilities that deal with this sort of waste. As well as focusing on the changes we can make personally, or as a company, we also need to ask for national change to tackle recycling on a larger scale as we plan for a more effective way of working sustainably in the long term.